I want to open up the branding process of a SharePoint 2010 site from a designers perspective. Let’s face it, branding is expensive. Branding takes hours of hard work and with a product like SharePoint, frustration is constantly in the air. I present the idea of using the 80/20, or Pareto Principle on branding the SharePoint. The first step in branding, is of course the logo, typography and color scheme. Uploading the logo, using themable or alternative CSS it’s a maximum of a few days task. Looks terrible but works on intranets and extranets. This is the level where you should usually stop and say: game over. This will satisfy the aforementioned 80% of the visitors. Here you modify or create a site from a mininal master page, use your own styles and override some of the core styles. Style a consistent look for web parts and page layouts and your’re all set. Usually this is a weeks job, depending on the complexity of the page layouts. With SharePoint 2010 it’s trivial to use the Site Master as a System Master but the easy part ends there. There is a tonne of new styles to re-brand and you will be moving pixels back and forth a lot. This is where the project starts to fail as this is the first step to re-branding the SharePoint UI. Let your client know that the risk starts here. With work estimates, we’re talking anything from one week to four weeks here and the outcome? A few people in the client’s public relations department will be happy. Work estimate? Somewhere between one month and eternity. Main reason that you change System Master Page in SharePoint is that Forms-pages use it. In SharePoint 2007 you also had application.master that was by default used in _layouts-pages. 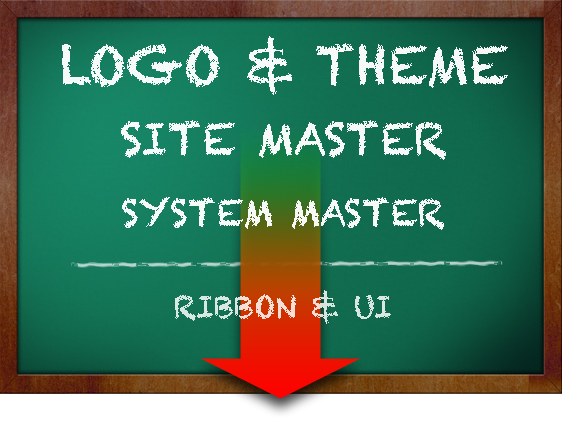 In 2010 System Master Page is now also used in _layouts-pages. It depends on a case whether or not Forms-pages should look like the current site. You can always embed document libraries in pages (web part zones or publishing html fields). And then you don’t really need Forms-pages, and you can offer access to them only for administration purposes. Thanks for the input Louise and Aapo! As Aapo describes above the problem usually is SharePoint libraries that use the system master. I know the feeling when you’ve done a great job designing a new layout and then ‘BOOM’ you end up in a list view that looks out of context. Then you go to site settings and change the system master to your own and everything is ok again? No. This is where the fun begins in Level 3. Typically it goes like this: You fix something, you break something else. There is no end to this. If you go through this once, I recommend that you try to make general fixes and overrides that can be used on all your future projects. If you decide not to change the system master, then you could do as Aapo explained. In the end, it’s all about balance between web designers and software designers. Thanks Aapo and Tuukka – have to agree with you on that one. I just deployed my latest Sp site (www.phoenixhumancapital.co.za), and this was my serious learning curve with changing master pages to suit the design. I think we did pretty well though. I had a look at a few other sharepoint designs whilst I was playing and saw that people either stuck to the base SP look or threw it out completely. One site I thought was an OS Commerce site it was so different. Dont even want to know how the designer and developer did it. Hey, thanks for the article. One comment; I you know what you are doing, a system master is not that complicated, what I will say about this; dont be scare here and it does not really have to take up to 4 weeks, if it´s not a really total extrem branding filled up with tons of jQueryplugins and more. Branding in SharePoint is Fun! Thanks for the comment Mr Peter! You’re right about the system master not being too complicated and if you are not heavy on branding and the layout is fluid, all’s well. My point, however is that there are not too many people on a typical SharePoint project that get to see whether the system master is customized or not. Most of the people (client) involved in a typical project don’t even know of the existence of dual master pages on these areas. When navigating to a page that uses a non branded system master, they just report that the UI is broken; not realizing that the UI is fine, just different. If you clearly state on an early state that customizing the system master is a separate task and not on the usual project scope, there will be no misunderstandings. If this is the case, I usually suggest using the same master page on both sides as it’s easier to keep the look and feel consistent. Now the “up-to-4-weeks” scenario involves a lot of tweaking on lists and forms on a possible non-fluid layout that’s not intented for backend use. This is quite common if you work as a subcontractor. And yes extreme branding is FUN because we all want to tweaky-tweaky and I find myself far to often doing it just for the sake of doing it (because SharePoint is so much FUN). Nice Article, Do you have any tutorials about these levels? please public some tutorials. but could you please clarify this for me. If I edit a masterpage of a sub-site will it effect the parent site? Jeffrey, you sub-site depends of parent site, but your parent site is not depends of their sub-sites, all sites have a master page, you can have a sites whit diferent desing. Regards. But make it easy and don’t waste your time with searching for the right css tags. Could I please get your authorization to publish this article on my Bebo and Facebook account? Superb page, Continue the wonderful work. Regards!.